Who Are You? Why is Unknown Spelled Wrong!? So yesterday I went to Oakland to check out their Gay Pride Celebration and it was pretty good! It cost $5 for regular admission and $10 for the “VIP” admission which knocked $1 off drinks. If I were to compare the experience to Pride in San Francisco I would have to say Oakland is a winner. Due to having to pay to get in, I doubt any naked people were admitted, which is a major turn off for many in San Francisco. I attended San Francisco’s pride parade like I do every year, and there were more naked people then in public showers at your local YMCA! It was kind of gross… I was expecting a similar outcome in Oakland but, there were no naked people (that I saw at least). There were your typical “exhibitionists” or as some call Leather Daddies. I don’t want to scare any viewers with a definition of a “Leather Daddy” so get smart and Google it! 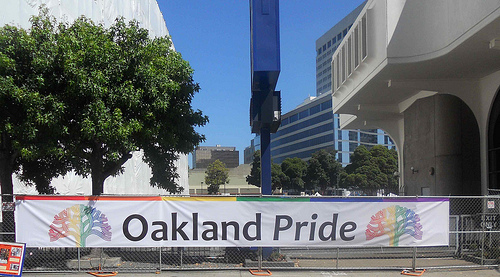 To cut a long story short, Oakland’s pride festivities were quite enjoyable and delightful. Entertainment was good, food was good, and the crowd wasn’t naked. San Francisco: TAKE NOTES! OAKLAND MIGHT HAVE JUST WON THE BATTLE OF THE QUEENS THIS YEAR! So This Is How They Do Me, Huh?